RBTH presents a selection of views from leading Russian media on international events, featuring a report on the UN Security Council’s acceptance of Russia's resolution on Ukraine, analysis of the threat posed to the ceasefire agreement in Ukraine by the fighting around the key town of Debaltsevo, and a review of Russian President Vladimir Putin's visit to Hungary. The tabloid newspaper Moskovsky Komsomolets writes that on Feb. 17, during an emergency meeting in New York, the UN Security Council approved Russia's resolution on the support of the Minsk Agreements for regulating the crisis in Ukraine. The newspaper reminds its readers that the resolution, which Russia presented to the UN Security Council on Feb. 13, aims at implementing the Minsk Agreements. The document reflects the concern about the violence in eastern Ukraine and the necessity of solving the situation through peaceful means, adds Moskovsky Komsomolets. "The resolution calls on all sides to fully carry out all the measures, including the comprehensive ceasefire," the newspaper writes, citing the Security Council's announcement. Moreover, the announcement underlines that the conflict in the southeast can be regulated only through a peaceful solution and that the council's members regret that, despite the ceasefire, military activity has continued in eastern Ukraine, in particular around the town of Debaltsevo. 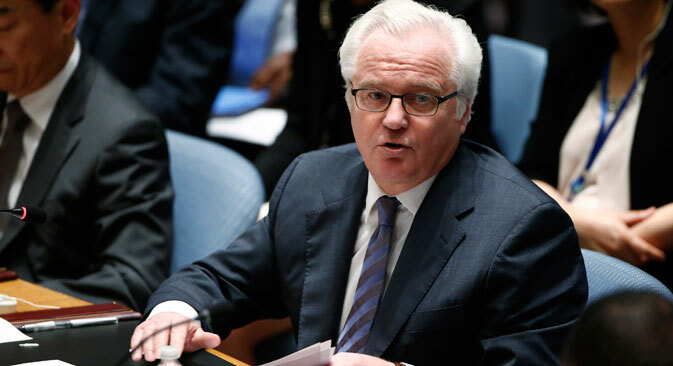 The newspaper quotes Russia’s Permanent Representative to the UN Vitaly Churkin: "We are convinced that after the unprecedented diplomatic efforts made on February 12 in Minsk there exists a real possibility for Ukraine to turn this dramatic page in its history." "The belligerent parties in Ukraine have only a few days left to prevent the failure of the Minsk Agreements due to the fighting in Debaltsevo," writes the Vedomosti business daily on events in the Donbass region of eastern Ukraine. The newspaper remarks that late on the evening of Monday, Feb. 16 the leaders of Russia, Ukraine, France and Germany discussed the situation in the Donbass over the phone. German Chancellor Angela Merkel's press announcement, according to Vedomosti, says that the leaders are concerned about the situation around the key railway town of Debaltsevo and that they discussed the implementation of the new Minsk Agreements. Germany believes that the withdrawal of heavy weaponry should have begun, as stated in the agreements, on Tuesday, Feb. 17. "There is still time to save the Minsk Agreements," Vedomosti writes, citing political analyst Fyodor Lukyanov. According to Lukyanov, everyone understands that the situation in Debaltsevo has particular characteristics and that the leaders were not able to reach an agreement on it in Minsk. Unfortunately, it partly resembles the earlier situation at Donetsk airport, when fighting for control of the airport led to the failure of the first Minsk Agreements signed in September. "The time left is not great and if the situation in Debaltsevo is not, in one way or another, resolved by the end of this week or the beginning of the following one, this may have dangerous consequences for the fate of the peace agreements," said Lukyanov. The centrist Nezavisimaya Gazeta newspaper reports on Russian President Vladimir Putin's visit to Budapest, where he held talks with Prime Minister Victor Orban and President Janos Ader. In relation to the unpredictability of world energy prices, Budapest is trying to sign a "maximally flexible contract" with Moscow, according to Nezavisimaya Gazeta. Director of the European Security Department at the Russian Academy of Sciences’ Institute of Europe Dmitry Danilov told Nezavisimaya Gazeta that it is doubtful that Russia is trying to form a "fifth column" within the EU with Hungary's assistance. "Even though it was possible for the EU to agree on a common anti-Russian political platform immediately after the annexation of Crimea, later it became clear that there are different national interests," said Danilov. Danilov believes that while Germany, for example, is willing to bear the costs related to the sanctions policy, Hungary, whose economy is dependent on the Russian market, cannot.